If your appetite is for an exciting vacation then this is the trip for you. Our trips feature campfire cuisine; capable and friendly cooks, guides, and wranglers. We know how to make your trip a pleasure you will never forget. Traveling through the beauty and grandeur of the River of No Return Wilderness in the Bighorn Crags, you will experience some of the most fantastic scenery on this continent. You are encouraged to spend your time pursuing "your" interests - ride, fish, hike, climb, identify flora and fauna, photography, or just relax. Menus can even be adjusted to fit your group's taste. Be sure to let us know at the time of booking. 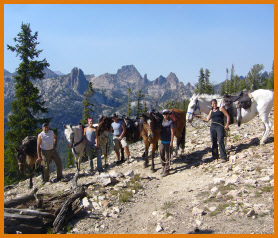 Our trips are full-service - just pack your personal gear and come visit Idaho's majestic mountains from the comfort of horseback. 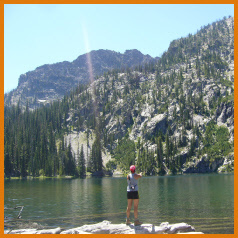 The Bighorn Crags are a fisherman's dream. This vast rugged area containing more than 40 high mountain lakes, rises from 3,500' on the canyon bottoms of the famous Salmon and Middle Fork Rivers to over 10,000' on Mt. McGuire. Rainbows, cutthroats, graylings, and brook trout as well as the elusive golden trout abound in this area. You may plan a four to ten day trip for either fly or spin-cast fishing. Combine it with horseback riding and eating out under the stars for a vacation to be long remembered. We pack in your equipment and supplies to the wilderness site of your choice. Then on a prearranged date we will return to meet you and bring you and your gear back to the Bighorn Crags trail head. We limit our spot packs to a distance we can reach and return from in one day. If a more remote destination is requested the rate will be adjusted accordingly. We will customize to meet your needs and desires. We have the trip for you!!!! Our full service trips feature campfire cuisine, capable and friendly cooks, guides and wranglers. We know how to make your trip a pleasure you will never forget. Traveling through the beauty and grandeur of the River of No Return Wilderness in the Bighorn Crags, you will experience some of most fantastic scenery on this continent. We can tailor a trip to meet your wishes. 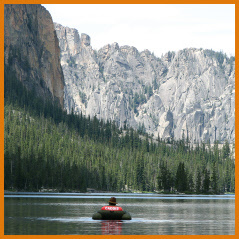 We have high mountain lakes with fantastic fishing, rugged canyons with pristine streams and secluded hot springs. We can explore old mining camps or just lay around. The minimum length of a fully guided trip is four days. This trip is designed for the person who enjoys the comfort of a first class mountain trip but would rather hike than ride a horse. We supply everything on this trip as we do on our wilderness pack trips except a saddle horse for you.